An article by PhD candidate Joshua Phillips appears in Volume 42, Issue 2 of the journal Studies in Language. The article, entitled “A sense of agency,” describes and discusses some of Joshua’s work on aboriginal Australian languages. 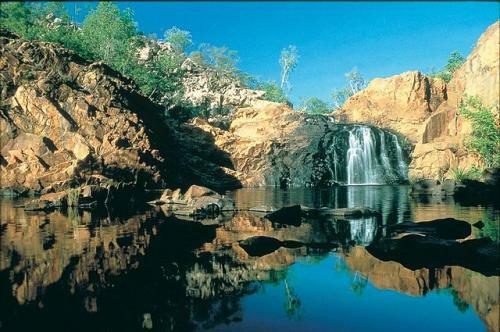 Roper Kriol is a language native to Arnhem Land, a region in Australia’s Northern Territory. As its name suggests, Roper Kriol is a creole language—a language that emerges when different groups of people, unable to understand one another, come into contact. The language has its origins in what is now Sydney, when the newly-arrived European colonists and the indigenous population interacted with one another for the first time. Since neither group could understand the other’s language, they developed a system of communication in which English words are combined with indigenous ones using a simplified grammar. This new language, known as Port Jackson Pidgin English, spread throughout Australia as Europeans moved northward and westward from the southeast part of the continent. Both colonists and indigenous communities relied on Port Jackson Pidgin English for communicating with communities that speak other languages, making the language a lingua franca in the region. By the 1870s, local forms of Port Jackson Pidgin English had developed in the Northern Territory, as European colonists and Chinese immigrants began to settle in the area. In 1908, the Church Missionary Society established the Roper River Mission, a boarding school intended to spread Christianity and Western culture to aboriginal Australians. Children were separated from their families and placed into dormitories. Because these children came from different language communities, they spoke to one another using the local variety of Port Jackson Pidgin English. While Port Jackson Pidgin English had previously been used only in special situations when different groups interacted with one another, the children of the Roper River Mission formed the language’s first generation of native speakers. As they used the language in their day-to-day lives, they developed a rich grammar and vocabulary, resulting in the Roper Kriol language that continues to be spoken today. While Roper Kriol includes elements from many different languages, most of the vocabulary comes from English. Joshua’s paper investigates two Roper Kriol words: ai and mi, corresponding to the English pronouns I and me, respectively. In English, I and me have the same meaning: they refer to the (one) person who is uttering the sentence in which they appear. The difference between I and me is that I can only be used as the subject of a sentence, while me can only be used as an object. To illustrate, consider the two sentences below. The asterisk (*) marks sentences that are not possible in English. I like ice cream./*Me like ice cream. *My cat likes I./My cat likes me. What is the difference between ai and mi in Roper Kriol? In some cases, ai and mi are used like their English counterparts. In others, Roper Kriol requires the use of mi where English requires the use of I. *Me am a very old woman./I am a very old woman. To compare the usage of ai and mi, Joshua conducted a statistical study of the Holi Baibul, a translation of the Bible into Roper Kriol. Joshua also travelled to the town of Ngukurr, where the Roper River Mission was located, to interview native speakers at the Ngukurr Language Centre. These studies show that ai is used primarily when the speaker of the sentence is actively performing some action, while mi is used when the speaker is passively experiencing the effects of some action, which may have been instigated by another person. For example, when ai is used with the verb silip “sleep,” it means that the speaker intentionally made a decision to sleep. On the other hand, when mi is used with silip, it means that the speaker fell asleep, without necessarily intending to do so. Joshua’s article is available on the publisher’s website. A subscription is required to access the article. Members of the Yale community can read the article by logging into campus wi-fi or the Yale proxy.